Home/Promotional/3C All Week on POV POOL! 3C All Week on POV POOL! 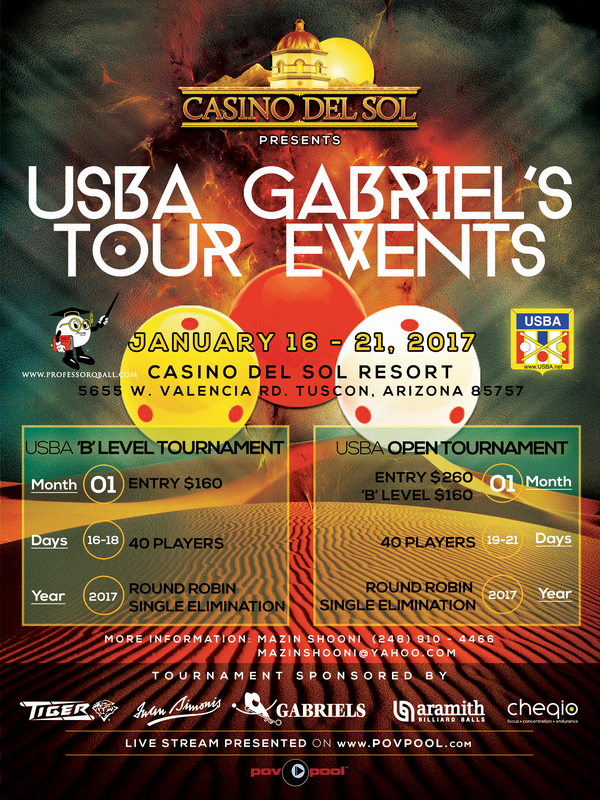 The USBA and Gabriels tables present their first of many tour stops at the Casino Del Sol in Tucson, Arizona. This event features two tournaments over the course of six days presented on Point of View Pool Media. The first tournament starts Monday, January 16th through the 18th, will feature any player that is a “B” ranked player and below. With a 40 player limit, this field has been filled for at least two months. The second tournament begins Thursday, January 19th and the finals scheduled for Saturday, January 21st. This is an open tournament that will feature US champion players, such as Hugo Patino, Pedro Piedrabuena, Mazin Shooni and many more! Don’t miss the 3-Cushion Action live on www.POVPOOL.com!!! Joss Tourney scheduled for Feb 9-10, POSTPONED until Feb 23-24 Due To Blizzard!